Send A/B email campaigns to learn what changes in your emails produce better results. What type of A/B tests can be done? A/B testing is a popular email marketing technique that consists of deploying two emails with slight variations and splitting your subscriber list randomly. The goal is to see what variation produces better results. A/B tests usually consist of different content, a different subject line, or a difference “from” address. A/B tests help take the guessing game out of figuring out what’s working in your email marketing. Before sending your email you will need to decide what you are testing. Only test one difference at a time. 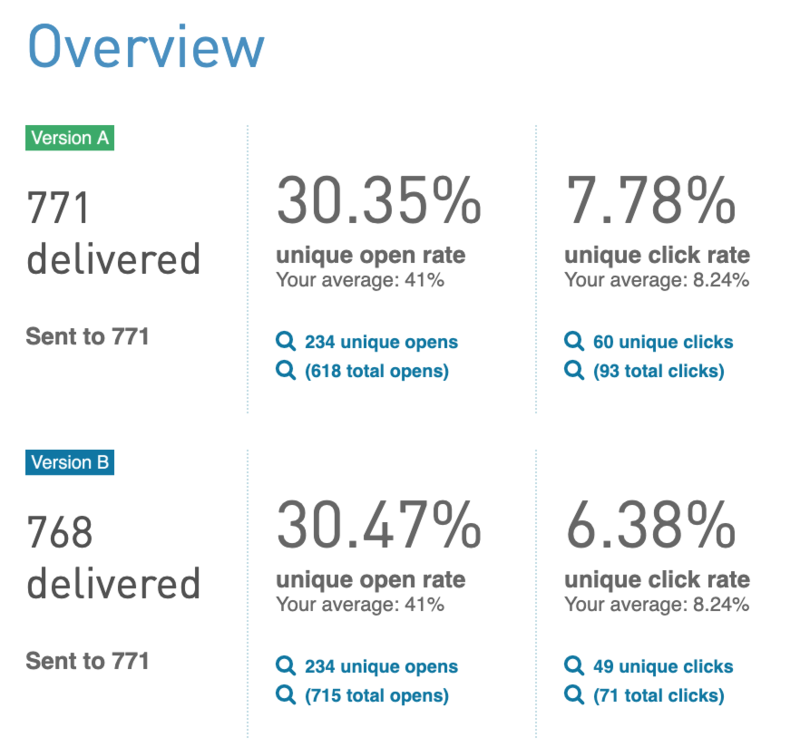 If you change more than one element in your email, you won’t know what element was responsible for the change in opens or clicks. Make sure you are comparing the same variable in each email. Then follow up by optimizing your emails, repeating another test to reduce variables and receive solid facts to help your marketing. Test both versions of your A/B test under the email campaign's Testing tab. The assigned subscriber list will automatically split randomly at the time of deployment. You will not know who is going to receive each campaign. Both subscriber lists deploy at the same time after the list is split. As with any campaign, each subscriber mailing processes the mailing queue one at a time. Label your A/B test campaigns with “AB test”. Once you have your results for a few A/B campaigns you can go to Reporting > Compare Campaigns to select this label and compare A and B results. Google Analytics tags will track each version separately through the tag utm_content. This tag will be set to version_A and version_B respectively. Learn more. Review A/B results in the reporting section. A/B tests send to the entire subscriber list. Conduct your tests to a small segment of your list to determine the best results and then send another email to the remainder of your list. A/B testing in WordFly is very simple. 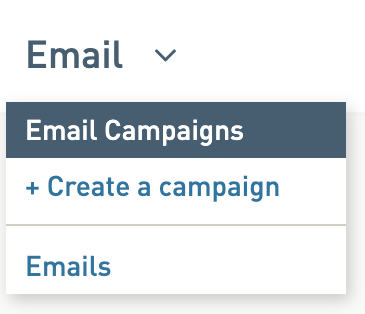 Just create a new email campaign and select which type of A/B test to run under the Settings tab. 1. Go to Emails > Create a campaign. 2. On the Settings tab, from the first drop-down select Standard. 3. Check the box for A/B testing. 4. Select your A/B test. 5. Save the Settings tab and finish your email campaign setup. Send your A/B campaign. Under the Template tab of your email campaign you will select Version A and Version B. In most cases you will duplicate Version B since your changes won’t be very different from the original template. Tip: Keep your test variable confined to one change for better tracking. 6. Go to Reporting > Dashboard to review your A/B campaign results. 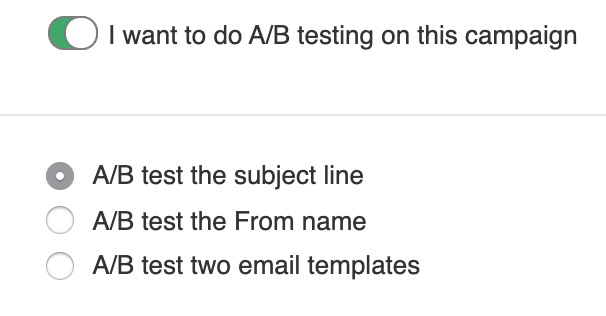 Name Personalization (First Name etc) Use either "A/B test subject line" or "A/B test template" for this one! You will use data fields to create personalization. Subject line Use "A/B test subject line". Put in separate subject lines. Special characters in subject line Use "A/B test subject line". Put in separate subject lines and insert special characters. Learn more about adding symbols to the subject line. Animated gifs Use "A/B test template" and insert different animated gifs in each template. Learn more about adding animated gifs to your email template. Embedded video Use "A/B test template" and insert an embedded video into one template and no video in the other template. Learn more about adding video to your email template. Button text and color Use "A/B test template" and adjust the styles in each email template to see how one works better. Learn more about global style updates in your email templates. Button placement Use "A/B test template" and adjust the placement of your buttons in each template. Does a button placed higher in the email template generate more engagement and conversions than placed lower in the email template? Postcard vs Newsletter design Use "A/B test template" and adjust the design of your email template. One design would be postcard and one would be newsletter style. Time of day or week This is the only test that is more about long term testing. There is not an option in WordFly to send at various times of day or week. The idea here is to send one A/B test at one time in a week and the next week you can try another A/B test at a different time or day. See how the results vary. Did one have better opens/clicks than the other? You can even do this same type of analysis without using A/B testing.